The Puget Sound is connected to Union Bay in Lake Washington via a 7.5 mile-long ship canal. Over Seattle's history, this area has been modified, most notably with the excavation of the Montlake cut, the Fremont cut and the construction of the Hiram M. Chittenden Locks. To allow for north-south traffic, six vehicular bridges and one train bridge span the waterway. Two of these bridges are fixed [Aurora 99 and I-5 (Ship Canal)], but five of these bridges will open for boat traffic. A historical map from 1894 and a present day aerial highlight how the area has changed. The two graphs below show the average annual weekday traffic over each bridge and the vertical clearance above water of each bridge. Notice the significant difference in vertical clearance between operable and fixed bridges, with both the Aurora bridge and the Ship Canal bridge having over 150 feet of vertical clearance. How often are bridges open and what trends have been occurring over the years? ​We fill focus on the Ballard Bridge in detail. Reviewing five year data that shows every single bridge opening (date, time and duration), the average amount of time the bridge has been up is 322 hours per year (see note 2). Interestingly, despite a booming population, bridge openings have not necessarily been increasing on an annual basis, with 2011 still being the busiest for number of openings, but 2012 being busier for total hours open per year. The longest recorded opening of 323 minutes occurred on April, 15th, 2012 for scheduled bridge painting. If we consolidate all of the bridge openings in 2015 into one 24-hour period, we can see when delays are more likely to occur. Per Federal regulation, the Ballard Bridge remains closed to boaters weekdays from 7:00 to 9:00 am and 4:00 to 6:00 pm, except national holidays. During closed periods, bridge openings are not made unless a vessel is 1,000 gross tons or more, or is towing a vessel exceeding 1,000 gross tons. This creates a backlog of boats, resulting in 6:00 pm having the most amount of openings in 2015, followed second by 9:00 am. Seasonality also plays a strong roll; 34% of bridge openings occurred in summer. In short: if you are looking to avoid getting caught in bridge opening traffic, avoiding crossing the bridge at 6:00 pm in summer. What type of vessels are causing the bridge to open? In 2015, there were close to 4,000 vessels that passed underneath the Ballard Bridge and required a bridge opening. This varies from the total number of bridge openings, accounted for by the fact that: 1) some openings result in multiple vessels passing through and 2) not all bridge openings are for boat traffic. We categorized the vessels types that passed through that year below. What angles does the bridge open at? Bridge opening angles vary, depending on boat size coming through. 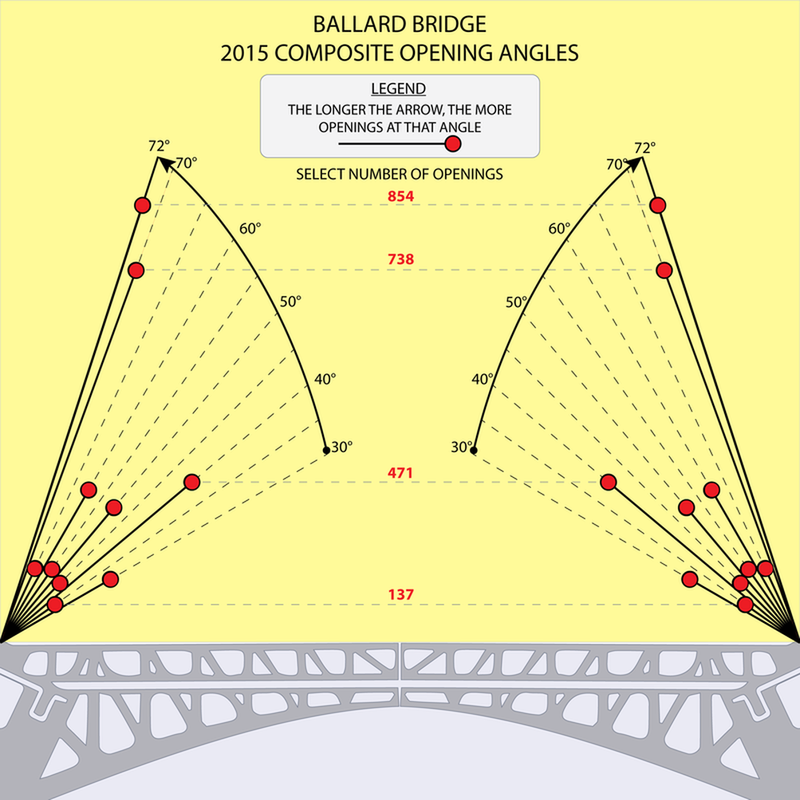 Opening angles typically range from 30-degrees up to 72-degrees. The plot below shows total number of opening at set angles, for angles that had 20 or more openings in 2015. 1) Bridge opening and closing data from City of Seattle. ​2) Bridge opening times logged in whole minute intervals, thus opening time is rounded off. ​3) Historical imagery per USGS Historical Topographic Map Explorer, present day imagery from Google Earth Pro.